Why not visit and see…? Amongst the overall splendour of St George’s Chapel it is sometimes easy to overlook, or pass by, some item of detail or an object in an aisle. Here are a few things to look out for in and around the Chapel from the very small to carvings high up the wall. 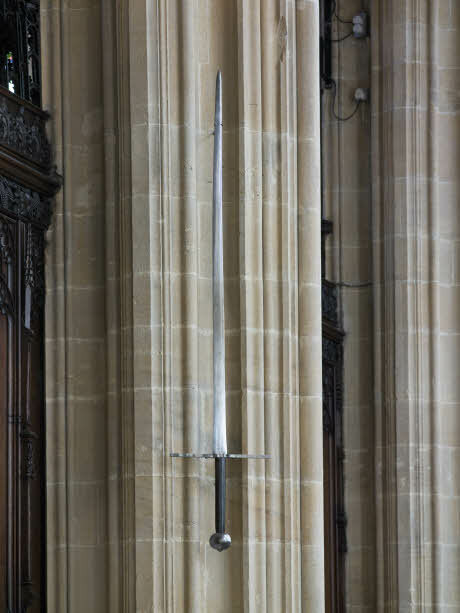 The sword of King Edward III hangs in the South Quire Aisle. The King founded both the Order of the Garter and the College of St George in 1348. 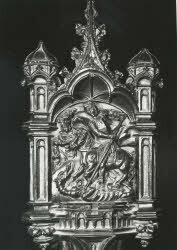 The sword has been in the current Chapel, and the building which preceded it, from the 14th century. It is a double handed sword measuring 6′ 8″ (2.032m). Today carved wooden swords hang above the stalls (seats) of the Knights of the Garter in the Quire of the Chapel. At the back of each stall are a number of copper or brass enameled plates. 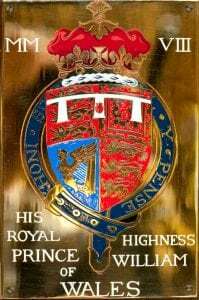 They carry the coats of arms of previous and current Knights of the Garter. Shown here is the stallplate of Sir John Chandos. He fought for King Edward III in many battles against the French, notably at Crecy and Poitiers. At Crecy he acted as bodyguard to the Black Prince (Edward III’s eldest son) and is said to have saved the 16 year old’s life on that occasion. There are about 800 stallplates in the Quire of St George’s and three are illustrated with this article. 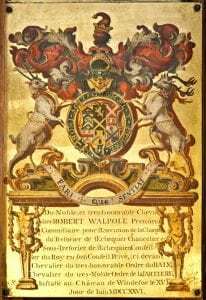 The other two are those of Robert Walpole, 1st Earl of Orford, Prime Minister in the 18th century, and from very recent times, Prince William, who became the 1,000th Knight of the Garter in 2008. A large legacy was left to St George’s by Sir Reginald Bray in 1503 which ensured the completion of the building. 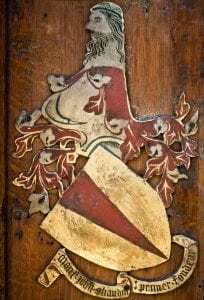 He is buried in the Bray chantry and his heraldic badge, a hempbrake, appears 175 times throughout the Chapel. It appears not only on large stone bosses in the vaulting but also in tiny metal details such as this door lock. 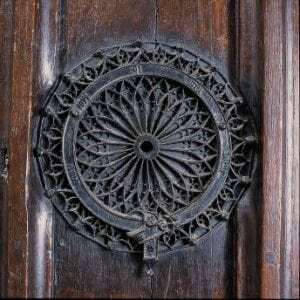 Even finer metalwork can be found in the Chapel; John Tresilian of Cornwall made the large metal gates that guard the tomb of Edward IV (who began the present Chapel) but he also made smaller items such as this circular latchpull. 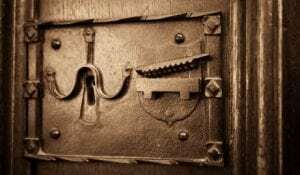 Originally a piece of string would have been threaded through the centre to lift the latch on the other side of the door. 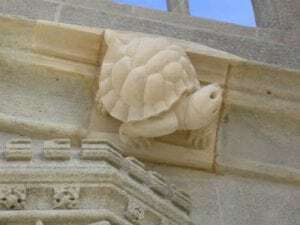 Stone carvings in the Chapel are not limited to heraldic devices on roof bosses. 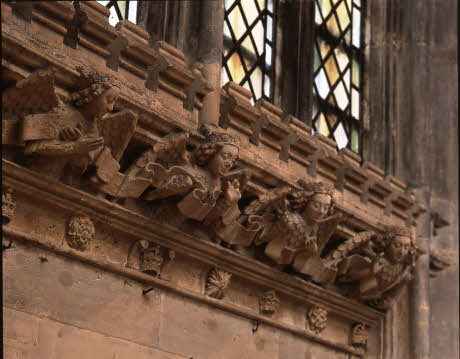 Running around the whole Chapel, below the line of the upper windows, is a frieze of beautifully carved angels. They hold a ribbon like stone parchment delicately in their fingers. Detail is also shown to great effect in carved wood in the Quire – humorous carvings sit alongside religious imagery and depictions of historical events. The Sovereign’s misericord shows the treaty of Picquigny signed between Edward IV and Louis XI of France. A cast of the misericord can be seen in the South Quire Aisle. Poppy heads in the Quire tell the life of St George on the south side and the life of Christ on the north side. 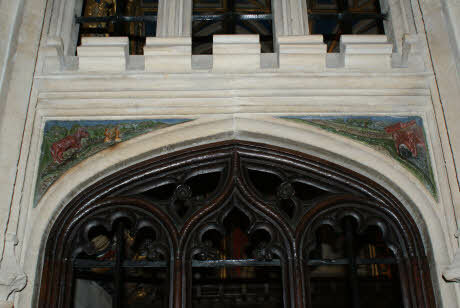 The emphasis on the visual is emphasized by a 3D rebus above the door of the Oxenbridge chantry chapel which shows oxen, an ‘N’ and a bridge. 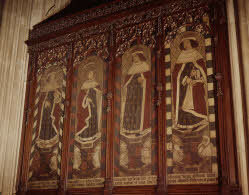 Nearby is a painted panel showing four Kings or Princes for whom Oliver King (who is buried opposite) was tutor or private secretary. The four are Henry VI’s son Prince Edward, Edward IV, Edward V (one of the Princes in the Tower) and Henry VII. 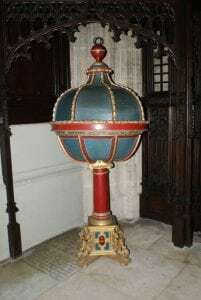 A carved and painted wooden font dating from the 17th century is still used at some Baptisms in the Chapel. It is moved into the centre of the Quire on the occasions when a Baptism takes place during a service of Sung Eucharist. 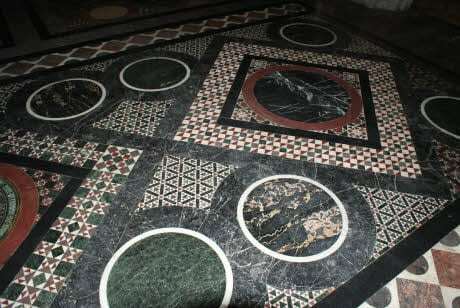 Another, though completely different, striking use of colour and form can be seen in the marble floor of the Albert Memorial Chapel. The Chapel which sits on the site of a 13th century chapel was refurbished by Queen Victoria as a memorial to Prince Albert, the Prince Consort, and can be viewed from its entrance after a visit to St George’s Chapel. 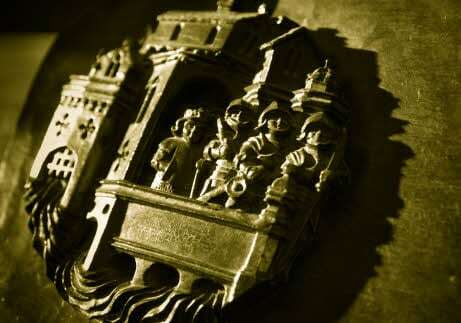 In modern times craftsmanship and artistic endeavour are no less active than in previous centuries. 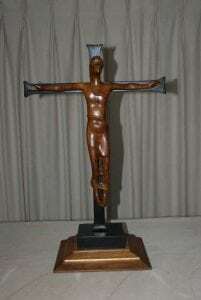 A small crucifix stands on the Altar of the Rutland chantry. It was carved in 1970 by Don Potter, a former pupil of Eric Gill. Don Potter was heavily involved in the very early years of the Scout movement so it is particularly appropriate that when, to mark its centenary in 2007 the Scout Association decided to give a gift to St George’s, it was a new altar and furniture for the Rutland Chantry. Each year in April all the new Queen’s Scouts (and before them all the new King’s Scouts) from around the United Kingdom gather at Windsor Castle for a parade followed by a service in St George’s. Modern craftsmanship continues to this day particularly in the form of stone sculpture. The Chapel and its surrounding buildings are undergoing over a decade of major cleaning and refurbishment. Many of the grotesques (carvings on the outside of the Chapel) are being conserved but some are so far beyond recognition they are being replaced. Students from the City & Guilds Art School are working closely with the Dean & Canons of Windsor to produce modern carvings rooted in a medieval style. For more information about how to visit St George’s Chapel click here. You will also find out more information about the architecture of the Chapel, the objects in it and the archives together with information about how to support this independent institution throughout this website.